The small town of Benllech on the east coast of Anglesey is a popular seaside resort and boasts one of the island's most beautiful beaches overlooking Penmon and Red Wharf Bay. The beach has been winner of the Blue Flag award since 2004, it is a popular spot for sea canoeing and surfing. The popularity of its beach makes Benllech, situated on the A5025, the main road around Anglesey, one of the most visited places on the island. Beach rangers patrol the beach in the summer months and there are organised games. The small promenade has a cafe and souvenir shop, ice cream kiosks and a car park. 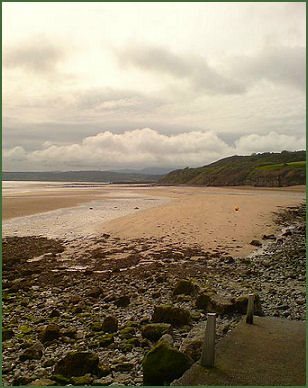 The name Benllech is possibly a mutated form of penllech, literally "head slab" or "head rock". Much of the town straddles the A5025 east coast Anglesey road, it is a popular retirement destination as the many of the population are over the age of 50 and are English speaking. The Anglesey Coastal Path passes through the town, a 200-kilometre (124 mile) long distance footpath which follows nearly the entire coastline of the island, which is designated an Area of Outstanding Natural Beauty. The coastal path passes through a varying landscape that includes farmland, coastal heath, dunes, salt-marsh, foreshore, cliffs and a few small pockets of woodland. Benllech offers a range of amenities to tourists, there are a number of inns and hotels, camping and caravan sites and several bed and breakfasts. There are also a number of supermarkets and a variety of shops. The famous Welsh poet Goronwy Owen (1723-1769) once lived in the town and the primary school at Benllech is named after him . 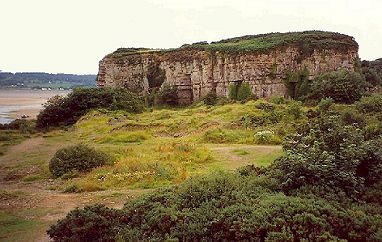 The Pant-y-Saer prehistoric burial chamber, one of many to be seen on Anglesey, lies just to the west of Benllech. The chambered tomb consists of a a kidney-shaped cairn composed of three uprights and a capstone with a horned forecourt. The capstone is extremely large, measuring around 3 metres square and over half a metre thick and it still retains traces of the mound or cairn that once covered the chamber .